This chapter introduces the topics covered in this book. The effective coverage and the overall quality in terms of the well-being of the target population reached by a given long-term care (LTC) programme are the result of a complex interaction of a number of determinants, which require a careful analysis of the different steps involved in the process. 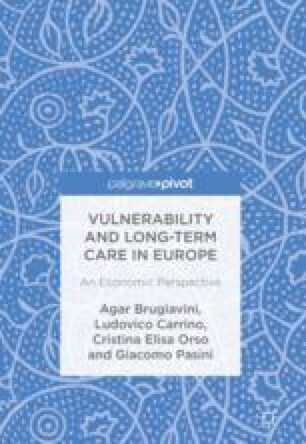 Hence, presenting a complete picture, analysing a detailed taxonomy and drawing some useful conclusions about the risk of vulnerability and the extent of dependency in old age represents a challenge because of the variety of solutions adopted in Europe. Our analysis makes two substantial contributions: the estimation of the coverage rates results from country-specific definitions of vulnerability, which have not been considered to date, without the imposition of any a priori criteria; second, the use of micro-data allows us to control for the different epidemiologic characteristics of European countries.